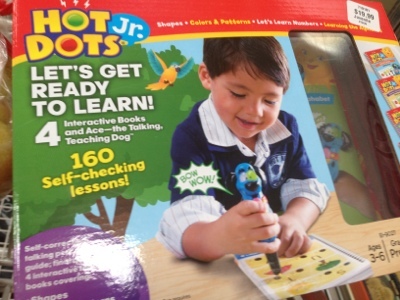 I gave my three year old grandchild one of these interactive book sets from Educational Insights last year. The "pen," Ace the Talking Dog, talks when you put it on the workbook and lets you know if you've chosen the correct answer. She liked it, and her little friends have liked playing with it so much that my daugther-in-law has wanted to use it as a birthday gift. The Costco in Detroit has been sold out for a long time; we looked again this past weekend, and I haven't seen them in West Nashville Costco until Monday. This one is for my three year old grandchild in Brooklyn. I hope she'll enjoy it as much.